Too many of us are used to cooking the same dishes over and over again. We get stuck in a rut with repetition of meals and it can be difficult to think of new ideas when we are busy working and looking after the family. A good way to try to broaden your repertoire is to experiment with different cuts of meat. Invariably they will require different methods of cooking than you are used to and will open your eyes to new combinations. Many supermarkets now are stocking cuts such as belly pork and brisket, but it is even better to pay a visit to your local butcher. You will be able to utilise their vast knowledge of different cuts of meat and ask for suggestions. In recent years, meat had been bred to be leaner, which is great for our health.Here are some examples of less popular cuts of beef and lamb, with some ideas for recipes to get the most out of them. The chump comes from the back of the animal, just above the leg. 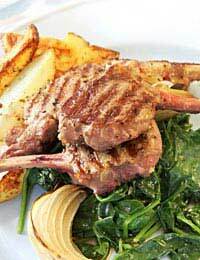 It is a rich meat with loads of flavour and can be cooked quickly to retain its character. It lends itself particularly well to grilling and barbequing. You can marinate your chump chops in powerful spices to compliment the strong lamb flavour - traditional partners like garlic and mint work well, as do jerk flavourings and chilli. You can also make a dry rub for your chops. When you have chosen your flavours, leave the meat at room temperature while you heat up your barbecue or grill - a griddle pan also works well if the weather is not suited to cooking outdoors. You will only need about 5 minutes each side for a charred outside and slightly pink inside - perfect! This cut is from the neck of the animal and is suited to slower cooking. A perfect winter dish is slow cooked lamb scrag - you can dust cubes of meat with seasoned flour and cook in a casserole with plenty of vegetables, potatoes and stock. This also works well with red wine. The chuck steak comes from behind the neck on the animal. A great way to cook it is to make traditional Cornish pasties. Small pieces of chuck steak are placed on a circle of pastry with onions, carrots, Swede and plenty of salt and pepper. Seal and crimp the edges and bake in a hot oven for 20 minutes, turning it down to medium for another 40 minutes. This is a really wonderful Saturday afternoon lunch to eat while enjoying a good football or rugby match! The meat from the back underside of the animal is the flank - this cut is perfect for stir frying and quick cooking. You can make a delicious steak sandwich with onions and tomato relish, or use it for a quick mid week supper. Slice your meat thinly and marinate it with some soy sauce, garlic and chilli. Stir fry with some julienne (thinly sliced) vegetables and spring onions and serve with plain boiled rice or noodles. This is idea for an after work supper instead of reaching for junk food or a takeaway - you will have a healthy, inexpensive supper ready in about 15 minutes from when you get in the door.